The next step is the submission of the CSR (Certificate Signing Request), which is a data file that contains your details as well as your Public Key. The CA (Certification Authority) would then validate your details. Following successful authentication of all details, you will be issued SSL certificate. The newly-issued SSL would be matched to your Private Key. From this point onwards, an encrypted link is established by your web server between your website and the customer's web browser. On the apparent level, the presence of an SSL protocol and an encrypted session is indicated by the presence of the lock icon in the address bar. A click on the lock icon displays to a user/customer details about your SSL. It's to be remembered that SSL Certificates are issued to either companies or legally accountable individuals only after proper authentication. The server sends back an acknowledgement that is encrypted with the session key. How do I implement SSL on my website? To implement SSL/TLS security on your website, you need to get and install a certificate from a trusted CA. A trusted CA will have its root certificates embedded in all major root store programs, meaning the certificate you purchase will be trusted by the internet browsers and mobile devices used by your website visitors. You should also decide which type of certificate suits you best. Single domain certificates allow you to secure one fully qualified domain name (FQDN). Multi-domain certificates allow website owners to secure multiple, distinct domains on a one certificate. For example, a single MDC can be used to secure domain-1.com, domain-2.com, domain-3.co.uk, domain-4.net and so on. Extended Validation certificates provide the highest levels of security, trust and customer conversion for online businesses. Because of this, EV certificates contain a unique differentiator designed to clearly communicate the trustworthiness of the website to its visitors. Whenever somebody visits a website that uses an EV SSL, the address bar will turn green in major browsers such as Internet Explorer, Firefox and Chrome. 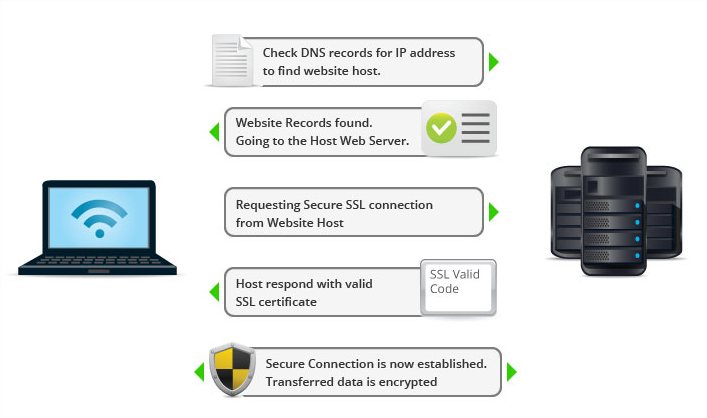 When SSL certificate is purchased from a web host, its activation is taken care of by the web host. The administrator of the website can also activate the SSL through Web Host Manager (WHM) or cPanel. In the WHM dashboard select the SSL/TLS option and choose "Generate SSL Certificate and Signing Request". Next, generate your Private Key and fill out the form for Certificate Signing Request (CSR). Ensure that you enter your domain name in the box asking for "Host to make cert for". You will need to send this CSR to your CA in order to purchase a certificate. Comodo offers detailed guides for installing certificates on various webservers too. 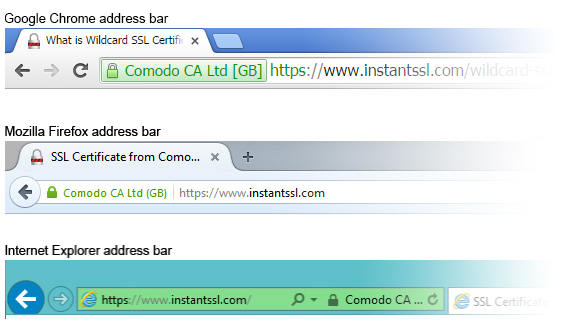 See SSL Certificate Installation on Different Web Servers for a full list. The guides provides installation instructions for different software types such as Apache, Apache on Cobalt, BEA, C2Net Stronghold, Ensim, F5, Hsphere, IBM, Microsoft, Netscape / Sun, Novell, Plesk, SSL Accelerator, Website Pro, and Zeus. Your website is now capable of HTTPS! You must now configure you website so that visitors who access this site get automatically directed to the "HTTPS" version. Search engine providers like Google are now offering SEO benefits to SSL pages, so the effort to serve all pages on your site over HTTPS is well worth it. A certificate authority or certification authority (CA) issues SSL certificates. On receiving an application, the CA verifies two factors: It confirms the legal identity of the enterprise/company seeking the certificate and whether the applicant controls the domain mentioned in the certificate. The issued SSL certificates are chained to a 'trusted root' certificate owned by the CA. Most popular internet browsers such as Firefox, Chrome, Internet Explorer, Microsoft Edge, and others have these root certificates embedded in their 'certificate store'. Only if a website certificate chains to a root in its certificate store will the browser allow a trusted and secure https connection. If a website certificate does not chain to a root then the browser will display a warning that the connection is not trusted. SSL Certificates will contain details of whom the certificate has been issued to. This includes the domain name or common name, serial number; the details of the issuer; the period of validity - issue date and expiry date; SHA Fingerprints; subject public key algorithm, subject's public key; certificate signature algorithm, certificate signature value. Other important details such as the type of certificate, SSL/TLS version, Perfect Forward Secrecy status, and cipher suite details are included. Organization validated and extended validation certificates also contain verified identity information about the owner of the website, including organization name, address, city, state and country. How can I tell when a site uses SSL? A padlock icon in the address bar of the browser before the address. With an Extended Validation Certificate, the address bar also shows the registered name of the company that owns the website, the name of the issuing CA and, an additional green security indicator.